My favourite antenna when working /P is the end fed half wave, set up vertically. It is easy to set up and works well with reasonable DX performance. It will not beat my portable hexbeam when working DX but that one requires more time, material and open space to set up. The EFHW vertical becomes a challenge however on the lower bands. Now I did get myself the largest Spiderbeam pole - so a vertical half wave for 40m is an option - but there is a limit and 80m will definitely not fit. One option then is to use a quarterwave vertical. However this requires radials if you want the majority of your signal to be radiated above ground. I developed a quarter wave for 80m with four elevated radials and it works but is quite a hassle to set up. Working /P you don't always have room for four elevated radials. Another option is to use the EFHW sloping. That is a good option and I have used it on numerous occasions. If the support is tall enough to allow for an angle around 45 degrees the antenna still has a low angle of radiation but also a lobe at a high angle. That makes it a versatile antenna. It has some directivity - in the direction of the slope. The challenge on 80m is that the EFHW sloping still requires a tall support for a reasonable (steep) sloping angle otherwise you will end up with only the high angle radiation. Another option - using a single support - is to use an inverted V dipole antenna. For 80m I find it a convenient antenna to set up and it comes with a unidirectional radiation pattern (in the horizontal plane) that fits my needs when I am "being chased" with chasers from all directions. The inverted V has a high angle of radiation. On my 18m pole it very much resembles a sloping half wave dipole of the same length. The main difference is that the sloping wire will have 6dB F/B ratio while the inverted V is omnidirectional. It is very much up to what you are looking for. Practically when working on 60m or 80m (or 160m) - for more than a few QSOs - I choose the inverted V antenna. When my tallest support still was only 12m I also chose the inverted V as my default antenna for 40m. 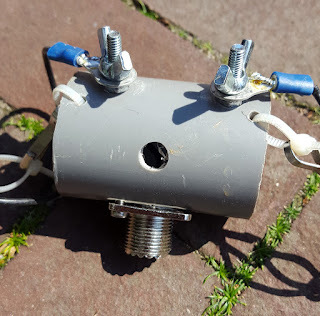 For my inverted V antennas I developed a universal center connector that fits on the fiberglass poles I use. 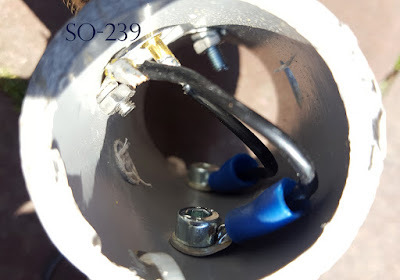 It is a simple component made from 40mm PVC that allows me to connect various wires to a SO-239 connector. The reason I designed it with changeable wires is that it allows me to make different combinations like 40m and 80m inverted V's on one pole fed by one coax cable. The tie wraps on the sides are used to keep the cable tension away from the soldered cable shoes - otherwise the shoe will certainly break in due course. The hole through the center allows it to slip over the top segment of my fiberglass poles. I developed a couple of these center connectors so I can set up different antennas at the same time. We use them for example with the YNOMY DX Group during the PACC contest when we set up three different inverted V's (40/80/160). We then have the 80m and 160m on the tallest mast together, being fed from one coax cable. For each inverted V I have two separate dipole legs. Each dipole leg is cut to the right size and features a cable shoe as visible in the first picture. To hold the wire I have constructed a cable spool consisting of a piece of PVC (40mm) with two end caps. On each end caps I have glued a piece of wood and through the end caps and wood I have put a piece of threaded wire. This spool holds the antenna wire plus a long enough end of tension string. I find it works rather conveniently in that I can just stick the spool in the ground (slightly under an angle) where it unreels while I extend the mast. Once I am happy with the position of the mast and antenna I push the spool further into the ground, stopping it from turning. This way I do not need pegs or anything else to set up this antenna. 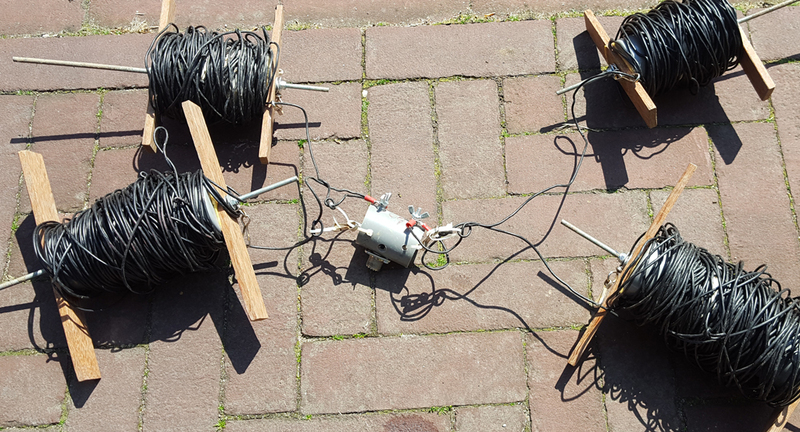 Below you see an impression of the antenna with four legs - dipoles for 80m and 160m - ready to be deployed. I just stick the spools in the ground in the direction I want the leg to go. Then I extend the fiberglass pole with the spools unreeling until the mast is fully extended. Then I pick up each spool and place it where I want the end point to be. The advantage of the spool unreeling is that there is only a slim chance the legs get entangled even when you have two dipoles on one mast - the wires are kept under some tension the whole time. I use a variety of antennas and poles/masts when /P. The 12m HD Spiderbeam is the most compact one I have and is easy to set up in the field without any supporting structures. The bigger ones I normally attach to the car one way or another or to any suitable construction I can find around the place I am going to be active from. My favourite and most versatile antenna pole is the Spiderbeam 18 HD fiberglass pole. I use it almost every /P activity. Preparing for a tour through LX I decided to implement some improvements that make the pole even more portable. I have twice set up the 18m HD Spiderbeam pole on my own using an ingenious structure with all the 6 guy lines extending while I pushed out the segments. That took quite a bit of time so I looked for another option. When I set up the pole using the car or a supporting structure I find that I do not use any of the supplied guy lines - so it should be possible to find a much simpler configuration to set up this pole in the field. I decided to try and set it up with only the lower segment guyed. 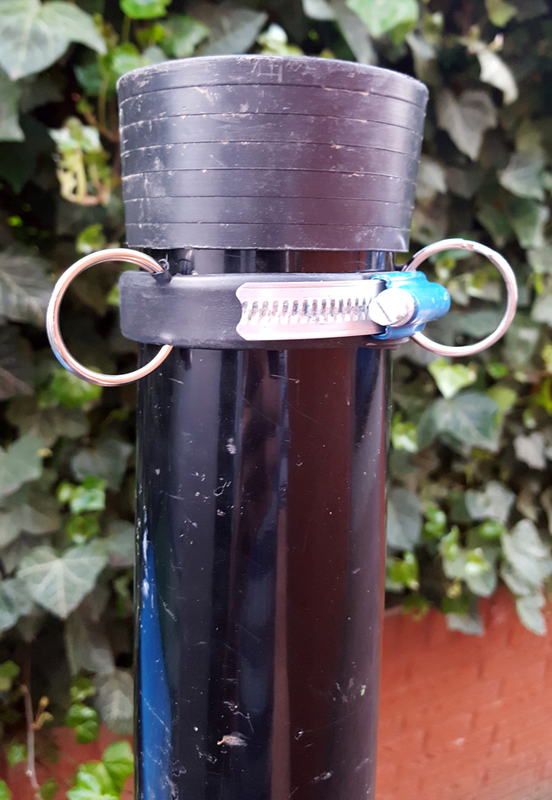 That would allow me to simply set up the pole while it is still collapsed and then push out the segments without worrying about any other guying arrangement. Borrowing from the idea behind the clamps Spiderbeam supplies for keeping the segments extended, I bought a hose clamp and applied rubber lint that I crimped in place. I cut some of the rubber away so I could add three rings. So now I have a permanent feature on my Spiderbeam pole: fixed guy rings. 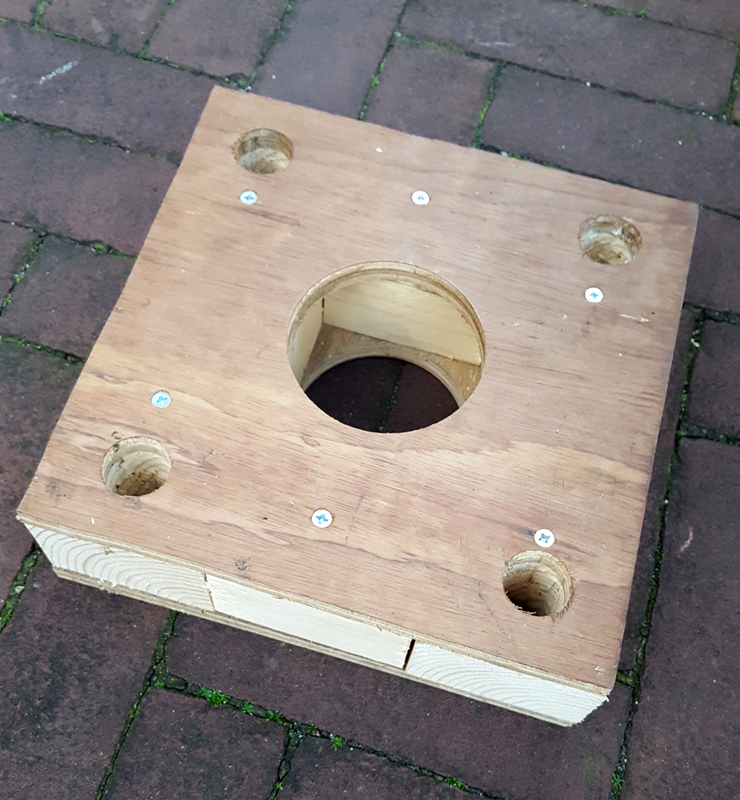 The center hole fits around the pole while the other holes can hold pegs that secure this little box in its place. Trying it in the field it turned out to work well - the Spiderbeam pole kept upright while I attached the lower guys. I used this a couple of hours with the pole extended 18m holding an efhw wire. Granted, it was not very windy that day. I will have to see if this is strong enough in higher winds. One last adjustment I made to the configuration is a replacement of the clamps that hold the segments in place when extended. The default clamps provided by Spiderbeam require a spanner or wrench to open and close. That is inconvenient and so I really did not use them often. I either extended the segments to the point that they stuck (with the risk that the antenna would collapse during a QSO) or I would use duct tape (that is quick to apply but not so easy to take off). So I bought clamps that have butterfly tightening tabs. I added rubber strip on the inside that I crimped on the clamps to protect the pole (like with the original clamps). I tried them and they work well.